Post contains a description and illustration of an exercise that may be helpful to people with Parkinson’s. Please be careful when exercising. This post is for information only. This is a simple exercise that I learnt during the physiotherapy class in which we attempted visualisation. It’s very easy. It probably doesn’t need illustrations, but I’ve done some anyhow. Make you hands into fists – as tight as you can. Then release the fists and stretch out the fingers to make a star shape – as wide as possible. A few repetitions should release some of the tension that has built up in the hands and forearms (my left hand gets very tight at times; it’s uncomfortable, verging on painful) and may also restore some of the ‘lost’ function for a short time. I find it slightly easier to do this exercise with both hands simultaneously; the able right hand ‘leads’ the left. It certainly loosens the affected hand up, and it does seem to help with functionality. I hardly lost any ‘A’s on that last bit of typing! Incidentally, even with a half-frozen left hand, the darn thing doesn’t stay properly still to be drawn! I had to reposition it (a trivial task) several times for each drawing. 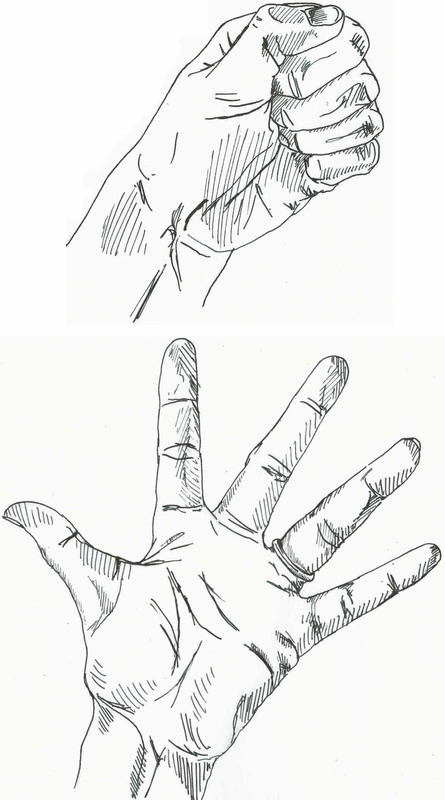 Categories: Illustrated Exercise, Relaxation | Tags: Hands, Parkinson's | Permalink. Relaxation techniques can be very useful to people with Parkinson’s. It makes sense: if your muscles tense up involuntarily, it should be possible to relax them deliberately and to attempt to stop it happening too often. On Friday, I attended a class organised by my enterprising physiotherapist, one of a series designed for people with a recent diagnosis of Parkinson’s. The attendees are, naturally, a mixed bunch, but I am, at 40, the youngest there; I think I may also be the closest to the beginning of my Parkinson’s journey. I was feeling a bit tentative this week, because my overall fitness has been impaired by a chest infection that I’m still getting over. I’d managed, earlier, to participate in my yoga class that falls, coincidentally, just before the physio class (it’s a bit tight getting from one to the other, but it just about works). I thought I might have to sit out anything too energetic, but, fortunately, this week’s theme was relaxation. We went through few techniques familiar to me from my yoga classes, notably breathing and body awareness. We were encouraged to adopt the position known, in yoga, as the corpse pose (Savasana). This is a very simple pose, being essentially lying flat on your back on the floor with your arms and legs flopped out, palms up (if possible – my left wrist is stiff but I can just about make it turn enough). This pose is particularly advantageous because it also helps promote good posture – something else that becomes an issue when you have Parkinson’s. And then we tried a visualisation exercise, which entails imagining yourself in a relaxing place. One of the most common relaxing places seems to be the beach. Off we went. A relaxation CD was playing pleasing wave noises. We were encouraged to think of lying on the beach, the waves lapping at the shore. I think my imagination is a bit overactive. Anyway, I started worrying about suntan lotion and wondering where my book was. Then palm trees got mentioned and suddenly we weren’t in Cornwall anymore. I decided it was too hot for me (and that I’d get sunburnt soon) and zoned out of the visualisation (by this time, some annoying synthesiser music had appeared alongside the waves on the CD, so I tried to block that out, too) and just concentrated on breathing and body awareness (which included tensing and relaxing groups of muscles). I’m not saying that visualisation doesn’t work for me. I think I could build my own, and have fun doing it (at the moment, I’m favouring a moorland scene with a stream burbling nearby). Probably my biggest problem was that I’m not much of beach person – or rather, that I’m not a sun worshipper. I like to walk along beaches, to build sandcastles with the kids and maybe read a book if I’m feeling lazy, but I’ve never been one for sunbathing. Interestingly, in the preceding yoga class, we’d done a similar exercise albeit without the visualisation. The doors were open and we could hear the birds singing outside… lovely. Then a Chinook came over – but, somehow, it didn’t quite spoil it for me. The birds were still singing after the helicopter had gone. 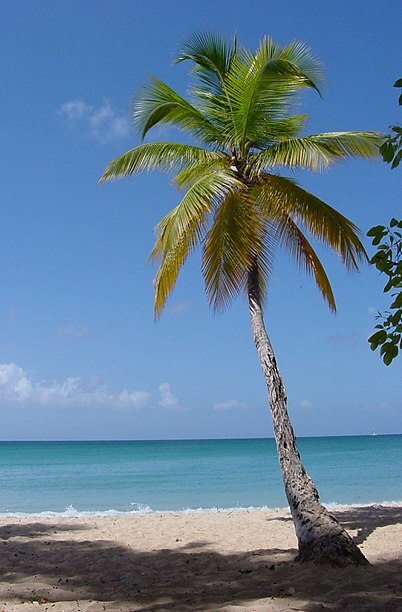 Categories: Illustrated Exercise, Physiotherapy, Posture, Relaxation, Support, Yoga | Tags: Beach, Palm Trees, Parkinson's, Visualisation, Waves | Permalink.